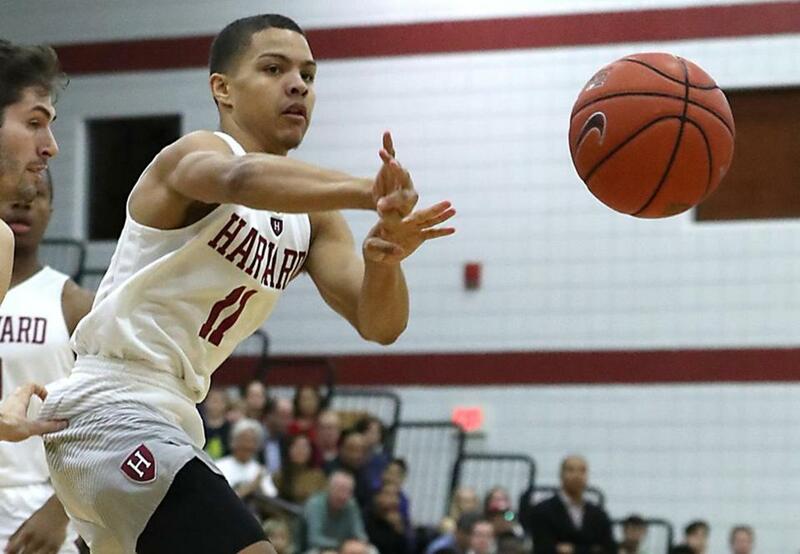 Bryce Aiken’s Harvard team will be shooting for an Ivy League title. Globe coverage of the 2018 Red Sox season and playoffs is available in a 128-page commemorative book. Launching a few thoughts from beyond the arc as college basketball season tips off Tuesday. Harvard has an excellent chance to win the Ivy League, run up an excellent regular-season record, and possibly even surprise some teams in the NCAA Tournament. The Crimson have everyone back, mostly notably guards Bryce Aiken and Seth Towns plus big man Chris Lewis. Most power-conference teams are wary of playing teams like the Crimson, so this season’s schedule isn’t that challenging. Harvard could win a lot of games. The biggest problems will be consecutive road games in November against Rhode Island, San Francisco, and Saint Mary’s; a trip to Vermont in December; and then a visit to North Carolina Jan. 2. Except for Carolina, all the games are winnable. Make time to see Northeastern play, just to get a look at star player Vasa Pusica, a 6-foot-5-inch guard from Serbia. He doesn’t look like a “player,’’ but he has a great, unselfish, all-around game. He also has a chance to lead the Huskies to the NCAA Tournament. Boston University was projected for a fourth-place finish in the Patriot League preseason poll, but the Terriers got two first-place votes. A lot has to come together, but they could be a conference contender. 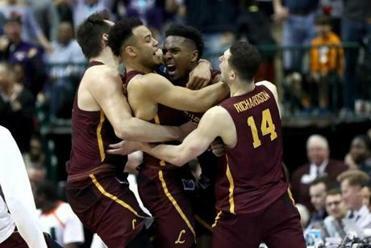 Could we have the next Loyola here in Massachusetts? When a team from a non-power conference achieves such success, it inspires the others on that level. Boston College has the look of a team that will be much like last season’s (19-16, 7-11), but freshman Jairus Hamilton could make a big difference. Physically, at 6-8, 234, he’s ready. We don’t know yet whether he’s there mentally. Coach Jim Christian is convinced that point guard Ky Bowman can take a path similar to Jerome Robinson’s. That is, improve so much over a season that he would become an NBA first-round pick. Eventually, I believe, coach Matt McCall will be successful at UMass. That’s defined as being an Atlantic 10 contender and getting into the NCAA Tournament at least every few years. It’s not going to happen this season, which could be a long one. The fans have to be patient, and they should be entertained by Luwane Pipkins. He averaged 21.1 points last season and he might exceed that this season. Hopefully, the Sign Man stays around too. Kentucky should be powerful. Last season, John Calipari relied too much on freshmen. This season, he’ll have a good mix of returning players and his usual array of talented freshmen, plus a graduate transfer, big man Reid Travis from Stanford. That kind of combination usually adds up to a Final Four-type season. Southeastern Kentucky State — which you might know as Duke University (keep in mind, the Blue Devils are playing the exact same one-and-done game as Kentucky) — is also highly ranked. How good it will be also depends on how good its freshmen are. The two big names are R.J. Barrett and Zion Williamson. Barrett, a Canadian, is a 6-7 guard who has been mentioned as a possible National Player of the Year candidate. Williamson is a mammoth 6-7, 284, and an Internet sensation because of his dunks. Of course, it’s basketball not dunketball, so we’ll see. Keep in mind that a year ago few fans knew who Trae Young was at this point. Then he led the nation in scoring and assists. I’ll wait a few games before anointing anyone. The corruption trial involving Adidas and multiple schools probably won’t have much of an effect on this season, with one exception: Kansas will not have big man Silvio De Sousa. His name came up in testimony about money changing hands, so it’s hard to imagine that he would play for Kansas again. That being said, the Jayhawks will be outstanding even without him, mostly because of a mix of transfers and highly regarded freshman (Quentin Grimes, Devon Dotson, David McCormack). The big transfer is D.J. Lawson, a 6-8 forward from Memphis. Some have projected him as a first-team All-American. Problems will come later for Kansas and others. The NCAA is waiting until all the corruption trials are over, then will investigate and sanctions undoubtedly will be forthcoming. There’s a step the NCAA can take in trying to separate itself from shoe companies bribing players, parents, and amateur coaches. The schools should buy their own equipment, including footwear, and stop being associated with the shoe companies. Fat chance, right? At this point, I have to quote the great Bob Ryan: Despite all the problems, we still watch the games because the games are great to watch. The season opens Tuesday with a landmark doubleheader in Indianapolis. Kansas plays Michigan State first, followed by Kentucky against Duke. It will be tape-delayed for me; I will use my TiVo and watch later after attending BU-Northeastern. Wichita State plays at Providence Friday; that’s a matchup you don’t see every day. Wichita isn’t as good as it was last season, but it’s an interesting intersectional meeting. Northeastern and Harvard also play Friday night.